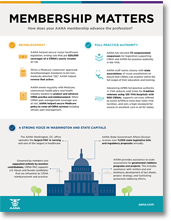 Did you know that renewing your AANA membership supports our profession at both the state and national levels? By choosing to remain an AANA member, you’ll automatically remain a member of the Vermont Association of Nurse Anesthetists (VTANA) as well. In fact, 36 percent of your AANA dues go directly to support our state association, allowing us to protect your ability to practice at the state and facility level. Select member-only benefits such as malpractice insurance, disability insurance, health and life insurance. We look forward to serving you throughout your career. VTANA and AANA will always be there when you need us most to provide consultative assistance on employment practices, clinical practice issues, quality of care issues, and much more. By renewing your membership, we will continue working to protect CRNA practice rights, ensure patient access to high-quality nurse anesthesia care, and provide you with the benefits and services you deserve.